GAAAAAAHHH! You guys, I am equally parts super excited and terrified at this very moment! 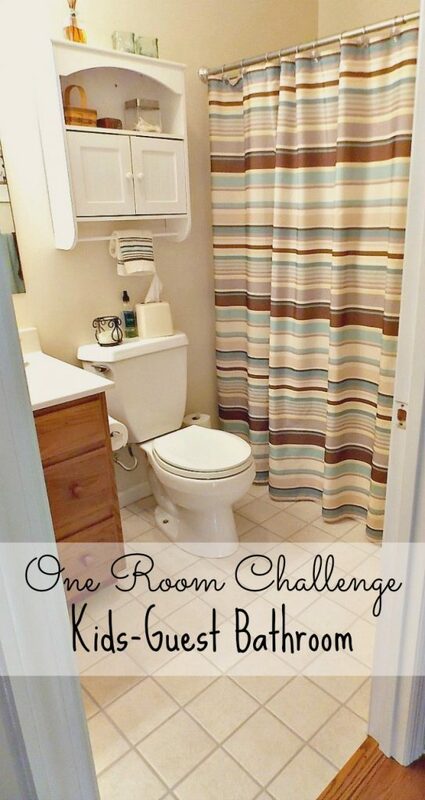 Because as of today, I am joining the One Room Challenge– affectionately referred to in blog land as ORC. I’m kind of shaking in my boots just writing this post for you today, and here’s why: the one room challenge is a widely anticipated two time per year event where 20 featured design bloggers transform a space and document it once per week for 6 weeks. In addition, everyone with a blog is invited to join the shenanigans and be a guest participant by linking up their own transformations for the 6 weeks. 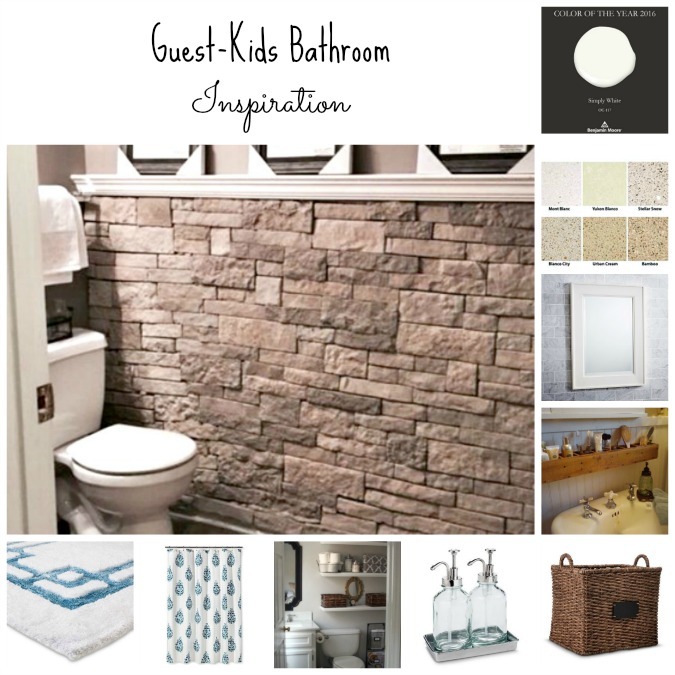 To date, more than 1,000 rooms have been transformed through the One Room Challenge, and this time I have decided my kids-guest bathroom is going to be one of them! I have so enjoyed devouring the room transformations of past participants, and I want in on the action. So, here we go- this is my first official post for the One Room Challenge! Yay! 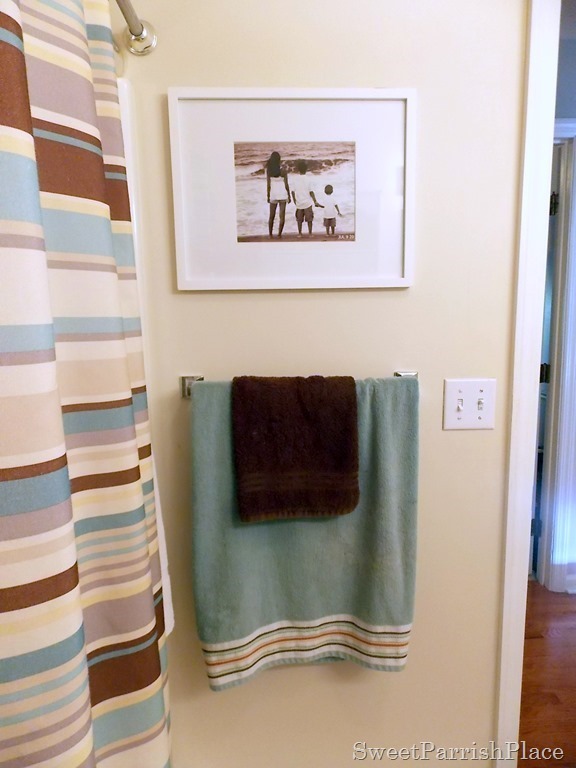 As you probably guessed by the picture at the top of my post, I have chosen to make over my guest/children’s bathroom for this challenge. 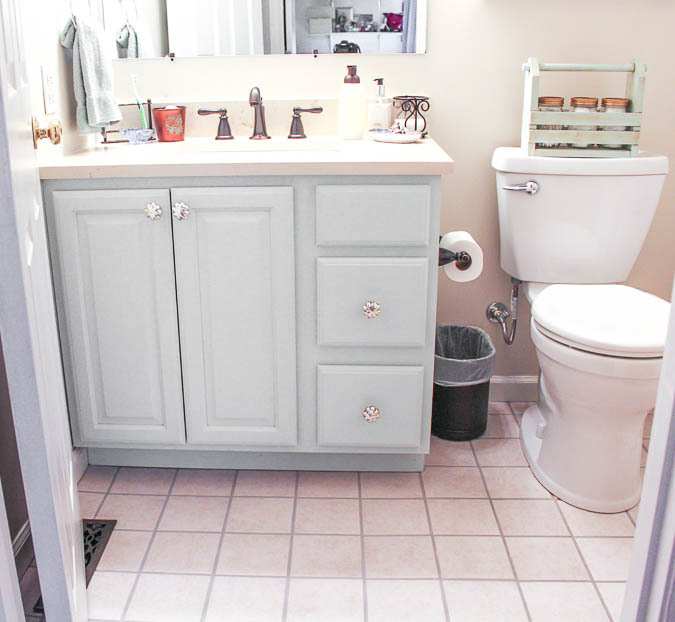 This is the bathroom that my daughter Delaney, and Mr. 8 Year old share, plus it is the bathroom used by our guests, so I want to do something special in here. I actually shared my plans for this room here back in May. 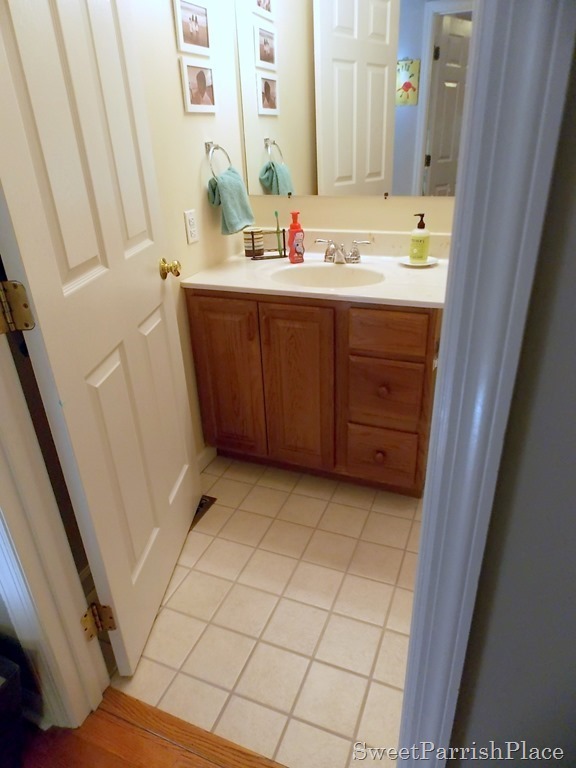 Let me share with you this bathroom in the beginning, shortly after we moved into this house, and this is they way it was for almost 4 years of living here. Not exactly pin worthy #amiright? It’s not horrible, and some people don’t mind the golden oak cabinetry so popular during the 1990’s. But I am over it to the max you all! I basically took everything out of the second bathroom from our old house and plopped it in this room when we moved in. These walls have never even been painted since we moved here. This is a collage I made back in May about the plans I have for this bathroom. And my plans pretty much remain the same. I actually have the vanity makeover finished already! So I guess I’m a leg up on some people. But it says in the rules that it’s OK if we have already began, so I’m not cheating! Here’s my made over vanity. I actually shared this already for a sponsored post, but I was asked to take out all other links, so I couldn’t link back to anything in that post, so I’m going to do that today. I am so so happy with this progress so far! 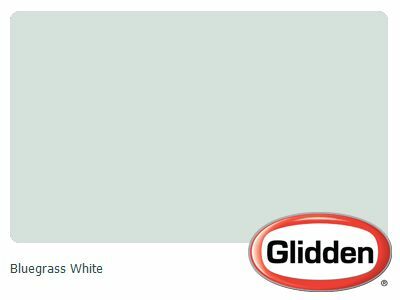 The color I used to paint this vanity is called bluegrass white by Glidden. I used a flat paint, and I sealed it with two coats of clear wax. 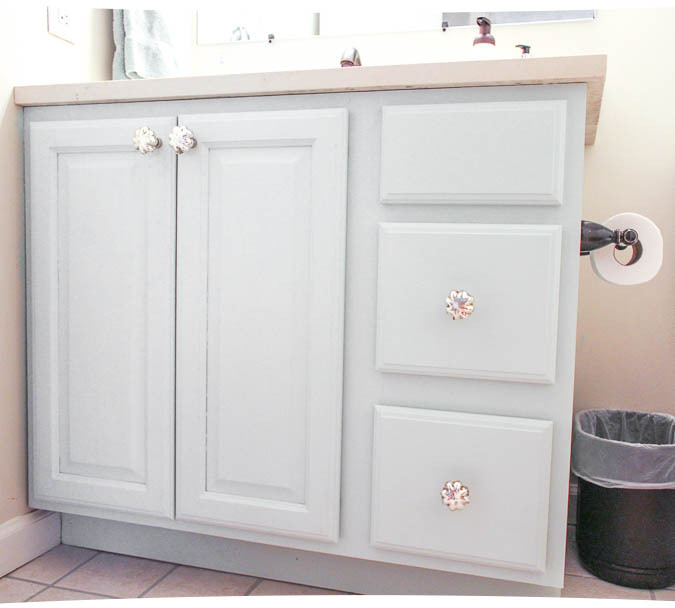 This is the same method I used to paint my cabinet in my master bathroom and it has held up wonderfully! I found the mercury glass knobs for the cabinet at Home Goods, and I think they will be perfect in the room because I am planning on having a mix of metals in here. 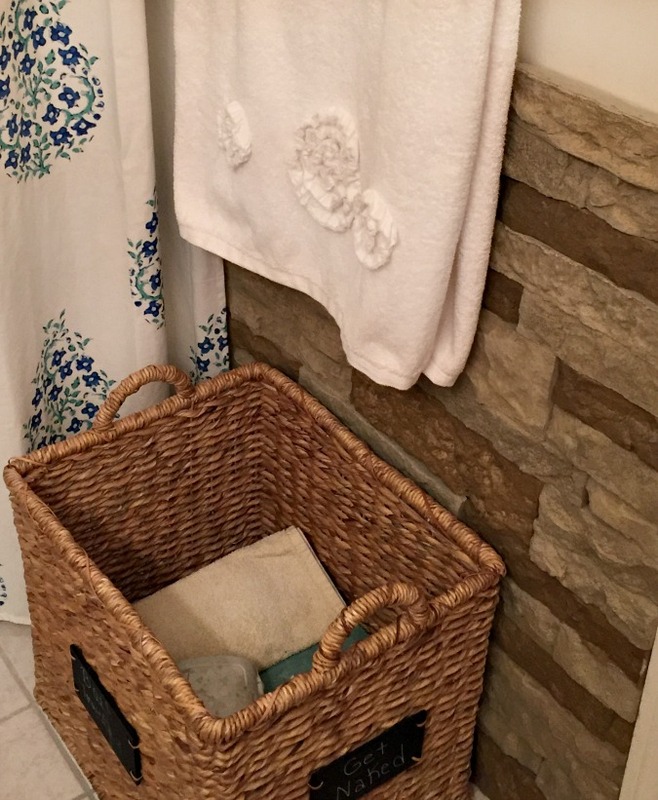 During the planning stages of this remodel, I approached the fine folks at Moen and asked them if they would partner with me for this renovation, and they very kindly sent me new faucets, a new showerhead, and new towel bars and hooks to use for this room. I chose to go with oil rubbed bronze fixtures. 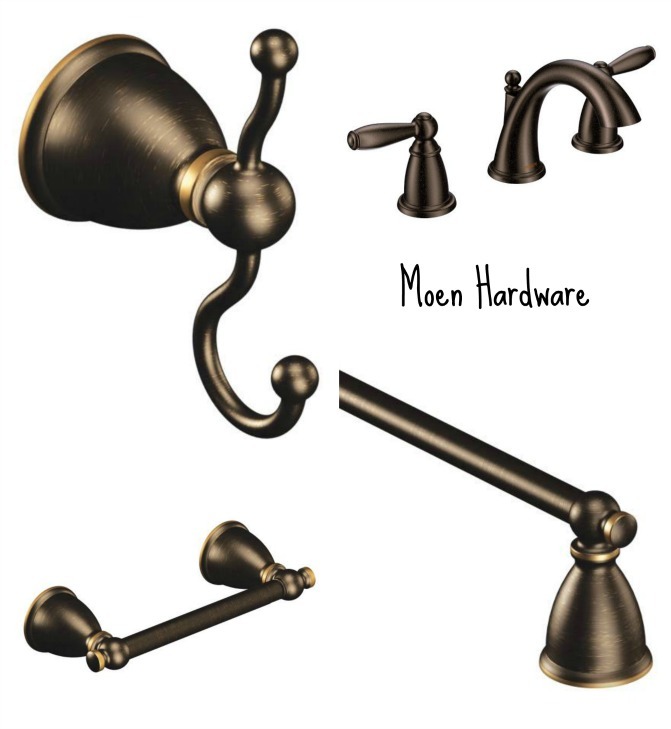 There are links below the pictures to the hardware I chose. 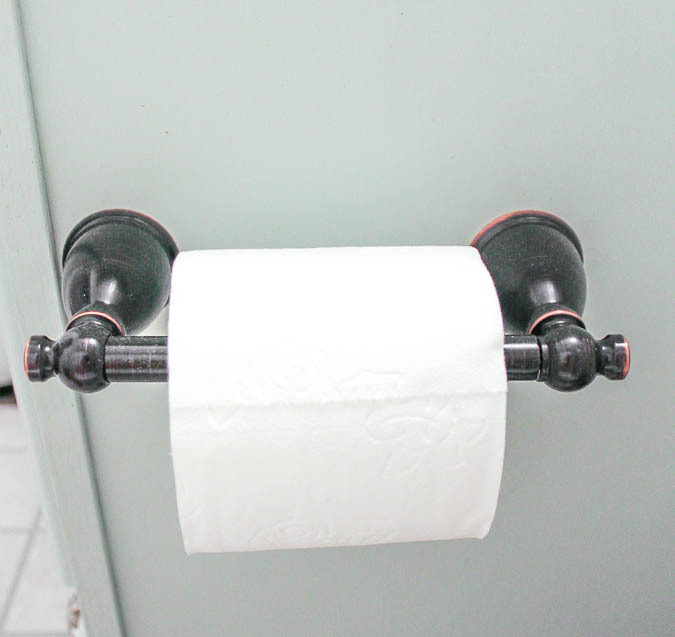 We added the toilet paper holder to the side of the vanity, which is where it was before. 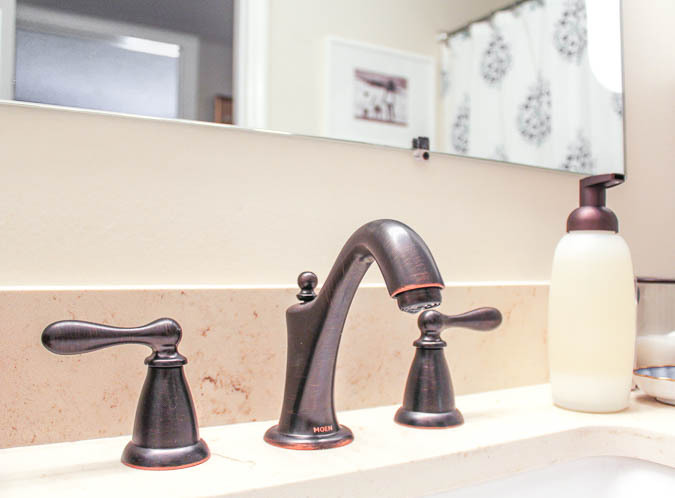 Changing up this vanity, even if it is the only thing we do in here, is such a huge improvement to the room! It is already a lighter, brighter feel. But there are many more changes on the horizon! Next up, we will be installing AirStone on the bottom half of the walls. I was given this Airstone by the company, to install our fireplace surround. I happen to have a whole bunch of it left over, so we wanted to use it somewhere else in the house, and my husband just wants all the boxes gone from the garage, so win-win! I’m not gonna lie, I have already started this project too, but it is far from being finished, and I will be sharing our progress with you on it next week. Here’s one little sneak peek though, because I just have to share! 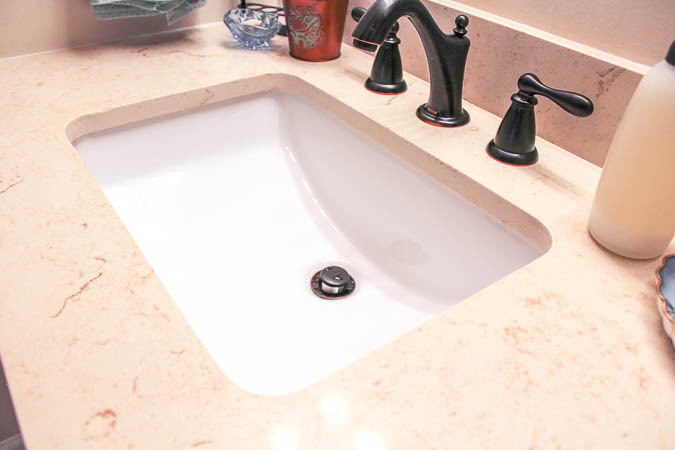 For this One Room Challenge, I will be updating you each Thursday on our progress in the room, so please come back next week to see what we have accomplished, I am hoping to finish up the AirStone this coming weekend, and after that we will be moving on to new lighting over the sink! There are hundreds of other bloggers who are also participating in this challenge, so please check out those here. I’m nervous, because the pressure is on to finish this room in 5 weeks, so I hope you will be routing for me! Or, you could come over and help me install some AirStone, lighting, or even slap some paint on the wall, any takers? If you are reading this and are also participating in the ORC, good luck!